Head West for Bucket List Adventures this Summer! Summer is the perfect time of year to raft some rapids, climb a mountain, head out to the wilderness, or do whatever you have to do to cross some items off your bucket list. Throughout the West, there are endless opportunities for experienced thrill seekers and outdoor novices alike to make some lasting memories and accomplish some of their loftiest goals. If you haven’t experienced the wonder of the Grand Canyon yet, what are you waiting for? This isn’t just one of the most beautiful spots in the world, it also features plenty of fun and adventure. A Grand Canyon rafting trip will allow you to cross two items off your list at once: seeing one of America’s great landmarks and rafting some rapids. An Idaho rafting trip will give you a unique perspective on the biggest undeveloped wilderness in the lower 48. 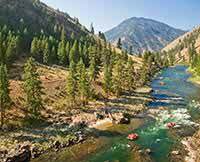 Idaho’s back country is a top destination for wilderness loving bucket listers, and you can experience it via the best rivers in the area — the Salmon River and the Snake River. If it’s rapids you seek, there are plenty other locations throughout the West that can satisfy your craving. A Colorado rafting trip can include two of the best and most popular rafting destinations: the Colorado River and the Arkansas River. The current river conditions in Colorado are pretty amazing after an intense snowmelt earlier this year. If you want to see the Rockies from a totally unique perspective, check out some Colorado zipline tours. You’ll feel like you’re learning to fly as you zip down a mountainside or over a deep canyon. Moab, Utah is a playground for outdoor enthusiasts, and it offers at least two ways for visitors to achieve some bucket list goals. Arches National Park features stunning scenery and many hiking trails leading to one of the best mountain peaks in the United States. There’s also some fantastic Utah river rafting in Moab. Check them both off with one trip! It may be a bit hard to find ideal rafting conditions in some locations in California this summer, but there are still two excellent rivers that are always worth a trip to the Sunshine State. For the best experience white water rafting in California, head to the South Fork or the Middle Fork of the American River. Join Us in the West! Western River Expeditions has the adventures you are looking for. Contact us today for more information about amazing rafting experiences in Utah, Idaho, Oregon, and the Grand Canyon! To take the perfect bucket list trip to Colorado this summer, contact AVA Rafting & Ziplining and ask about their adventure packages!